Our frigid weather + wind chills has reminded me that a bowl of steaming hearty homemade soup tastes so good on a cold evening! This is especially true in the winter. 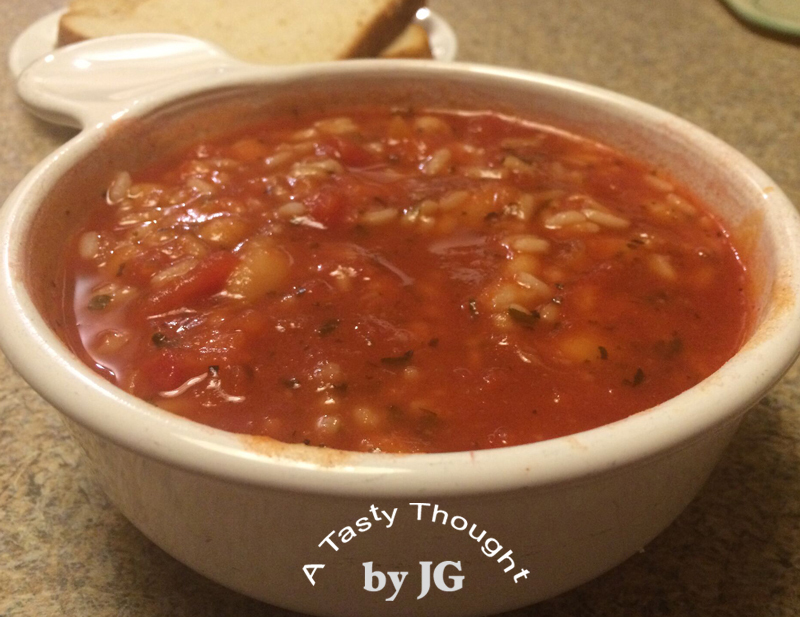 One very quick & easy homemade soup that tastes so yummy is Tomato Basil White Bean Soup! Each spoonful contains small pieces of tomatoes & White Kidney Beans. Then, there's the flavors & flakes of Basil & Parsley. Ahhh! This is one of those quick dinners that tastes amazing. The ingredients are always in my pantry. They probably are in yours, too. Everything is placed in my large pot! Then, the soup simmers. How easy can that be? If there is any "leftover" cooked white rice (from a previous dinner) in the fridge, I heat it to add to the soup bowls before serving. Otherwise, I now add prepared Couscous to the soup bowls. What a great addition! Do you add Couscous to your soups? 1 can Tomatoes, drained ***If using whole tomatoes, cut into eighths. ***I use whatever size can of Tomatoes I have in my pantry. Place all ingredients, except Cannellini Beans, in large pot or Dutch Oven. Drain Cannellini Beans & rinse in cold water, drain again. Add rinsed Cannellini Beans to large pot, stir. Simmer for 30 minutes & stir occasionally. Prepare Couscous: Place Couscous in a small bowl. To Couscous add the 1/4 Cup soup broth & stir. Let stand 5 Minutes, then stir again. Before serving soup, place prepared Couscous in soup bowls. Add the Tomato Basil White Bean Soup & stir. Enjoy with a slice of rye bread. If the soup gets a little thick while simmering, just add 2 ounces of water to the pot & stir in. Tomato Basil White Bean Soup is quick & easy to make! Ah, you're biting into a toasted English Muffin breakfast sandwich & suddenly the taste of a raisin and cheese hit your taste buds. Add an egg to that. Yes, it's a Raisin Easy Cheesey. This is a very quick breakfast to make on a weekend morning. You have the toaster/ toaster oven and a small frying or saute pan, so you're in business. Now, find your "short order cook" skills! There's no need to stop into a breakfast shop & order one of these tasty breakfasts! Add Raisin English Muffins & sliced cheese to your grocery list. Chances are the eggs are in your fridge. Breakfast does not need to be difficult to prepare to be so yummy! Split Raisin English Muffins, to toast. Place 1 slice of American Cheese on 1 half of toasted English Muffin. 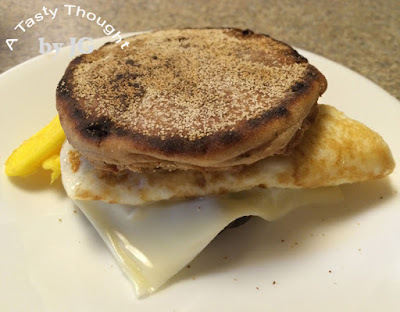 Top with Fried Egg & then the other toasted English Muffin half. ***If you like to use only Egg Whites while preparing breakfast, yes, 2 Egg Whites can be fried rather than 1 whole Egg for each Raisin Easy Cheesey. ***If you do not enjoy the taste of raisins, use Plain English Muffins. 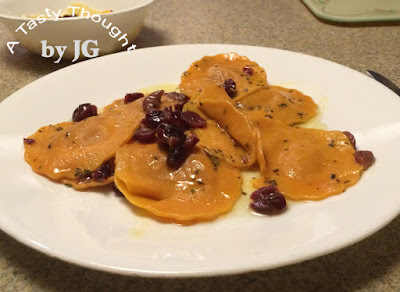 It had been a while since I had enjoyed Butternut Squash Ravioli! Too long! Last month in my local grocery store there were packages of these yummy easy to prepare pastas. Yes, the Butternut Squash Ravioli drought ended! Directions for preparing are on the package, but drizzling on Butter/ Margarine was not the option for me. Suddenly, I remembered the Plumped Craisins in the fridge. Butternut Squash & Plumped Craisins sounded like a great duo. The dried Basil is always in my Spice Rack & Olive Oil for baking & sauteing is also ready to use. Very quickly I learned that was a great combination for a topping! Double yum! So good! Prepare Ravioli following directions on package. Add 1- 2 Tablespoons Olive Oil for baking & sauteing in a 3 qt. pot. Add cooked Ravioli to pot. Add about 1/8 teaspoon Basil. Carefully stir Ravioli with Olive Oil & Basil. Add about 1 Tablespoon Plumped Craisins. Heat over Low for about 1 minute. After a busy day with no time to cook, what a tasty, easy dinner. Add a fruit or veggie salad & your meal is quick! O.K., winter has arrived in Massachusetts! We bundle up whenever heading outside wearing winter coats, gloves/ mittens & hats. It's also the time of year when the fresh produce in our grocery stores does not always look that fresh. 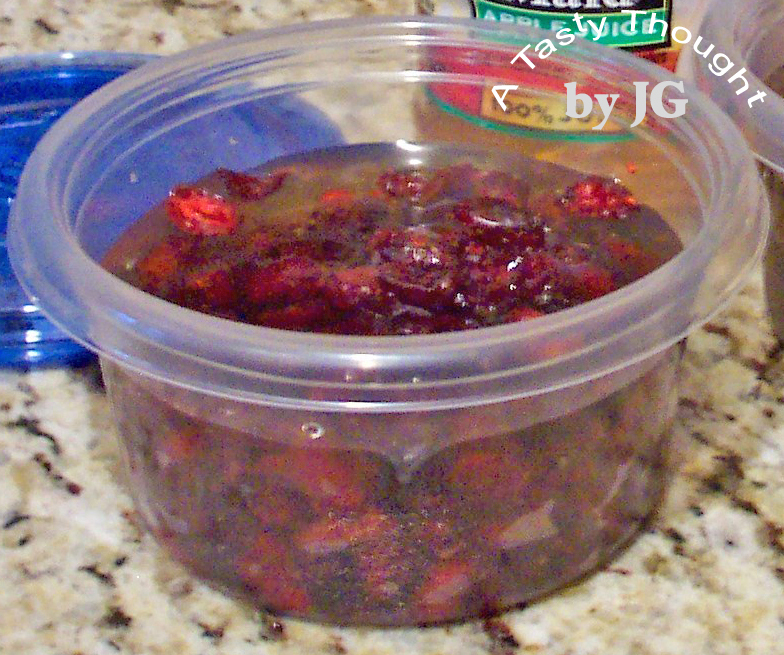 For me it's always been a reminder to plump up some Craisins (dried cranberries) in either water or apple juice. A 1 cup container is filled 1/2 full with Craisins. Then, add the liquid to cover the dried fruit. Cover & place in the fridge overnight. Store in fridge. These plumped little gems find their way into many foods for the next couple of weeks!